Hey guys! I hope your week is going well. This recipe is one that I am super excited to share with you all. 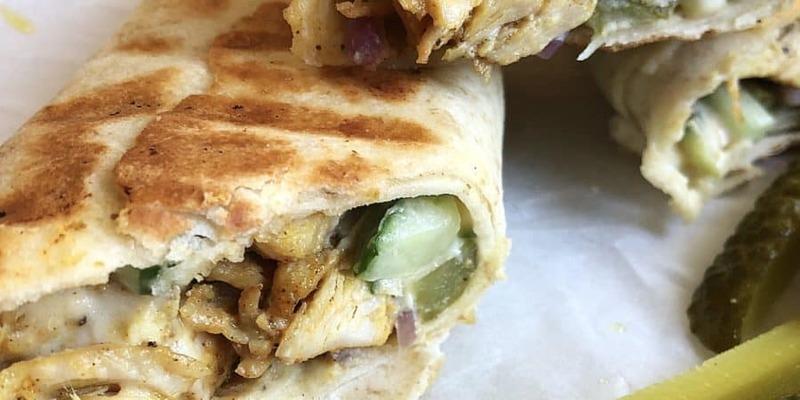 So, my fascination with chicken shawerma began when I was visiting Jordan in the summer times throughout my child and adult life. I always looked forward to going to Jordan just to eat some good shawerma from Al Day3a or Reem. Comment if you know those two places that I am talking about! It is so so good. Lately, I have been craving to have some good shawerma which seems hard to find around here. I know I needed to take business into my own hands and I think that I did a pretty good job! 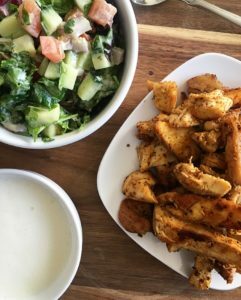 This recipe is easy to follow and tastes great especially when paired with toum (garlic sauce), Jerusalem salad, and some pickles in a wrap! I want some right now just writing about it. If you do try any of my recipes; I would love to know your thoughts and to see your creation! Leave me a comment below or reach out on social media with #fufuinthekitchen. Slice the chicken breasts into 6 pieces and the thighs into 4 pieces. Place in a large bowl and add all the ingredients above except use only half of the olive oil. Once chicken is tossed in the marinade put the chicken in a zip lock bag. Allow this to marinade for at least 2 hours in the fridge. It would be best to marinade over night for the most flavor. Once chicken is marinated, line a baking sheet with parchment paper or aluminum foil. Scatter the chicken onto the pan. Place into the preheated oven and bake for 15 minutes-20. Half way through, turn the chicken pieces so there is even cooking. Then take the chicken out of the oven, allow to cool for 5 minutes and then start slicing the chicken into smaller pieces so it will caramelize better when cooking in the skillet. Heat a skillet with some of the leftover olive oil and add half of the slice chicken. Cook for 5 minutes till parts start to crisp up. Those are the best pieces! Add some salt and pepper to this again while sauteing. Do the same thing for the other batch of sliced chicken. On a tortilla or wrap of choice, add your fixings like the sauce then layer with Jerusalem salad, pickles and the chicken shawerma. Roll the wrap tightly and press it on a grill or panini maker to get a nice crust and keep it warm. Enjoy with some Jerusalem salad and garlic sauce! You can find the recipe for the garlic sauce or toum on my blog as well. You can either have this on its own or with some rice. I like to make a shawerma wrap! Tried this recipe tonight and my husband and I loved it! Thank you!!! I made this and I absolutely loved it! Definitely would recommend this recipe!